The government has historically being following a specific 10-year cycle for implementing all recommendations made by CPC. Once the CPC is constituted, an18-month time frame is provided for reporting. The 7th Central Pay Commission did not break this cycle. The date by which 7th CPC was expected to give comprehensive and detailed report on its recommendations was expected to be somewhere in August 2015. For reasons unknown, the CPC however informed that it will fail to submit the recommendations within the desired date and the date is now pushed back by a month. It is expected that the CPC will hand over its recommendations by September this year. Retired Chairman, Armed Forces Tribunal. Smt. Meena Agarwal Secretary of CPC Officer on Special Duty, Ministry of Finance’s Expenditure Department. Dr. Rathin Roy Part time member of CPC Director, NIPFP. Shri Vivek Rae Member of CPC Secretary, Petroleum & Natural Gas. Historically, CPCs have always provided their recommendations based on what is known as Terms of Reference. The 7th CPC received the approved Terms of Reference on 28th February, 2014.The Terms of Reference actually work as a set of guidelines based on which the CPC is supposed to be examining and reviewing and if necessary, amending and recommending new changes to the pay structure of the central government employees. The pay structure is comprised of several components like basic pay grade, facilities and allowances and benefits either in kind or cash. The CPC is responsible for reviewing the existing pay structure as well as incentive schemes in place to understand how the existing salaries are affecting the overall performance, productivity and integrity of the central government employees. Even the retirement benefits and other pension schemes are to be reviewed and recommendations to be made if deemed necessary. Supreme Court employees and officers. Regulatory bodies’ members excluding Reserve Bank of India. Personnel of Union Territories and All India Services. Both non-industrial and industrial employees of central government. Current economic scenario of the nation. Impacts that will show up on finances of state governments because state governments usually follow central government when it comes to pay structure upgrade. Resources that will be left over for development works. The idea is that there should be ample money left after upward revision of pay structure for development works such infrastructure development, healthcare development, education etc. Existing pay structure and benefits. The review period has almost run its course with the 7th Central Pay Commission doing everything that needs to be done. It is expected that the reports of the 7th CPC will be submitted next month (September 2015). There are a number of blogs and websites that have already presented their own version of expected pay structures. Neither do we question their authenticity and nor do we accept them. The reasons are simple! The proposed pay structures found in several blogs and websites are based on assumptions. They mostly make use of the floating news of uniform multiplication factor that is used for calculating the upward revision of pay structure. Currently, the news floating around is that the multiplication factor that will be used for revising pay structures if 2.68 and the net hike will be 30% from the last drawn salary. We don’t know whether these numbers are accurate or not. The only best thing to do is to wait until the final reports are submitted and then approved. One of the most long standing controversies of Central Pay Commission is that of not including people from different services in the panel of members. 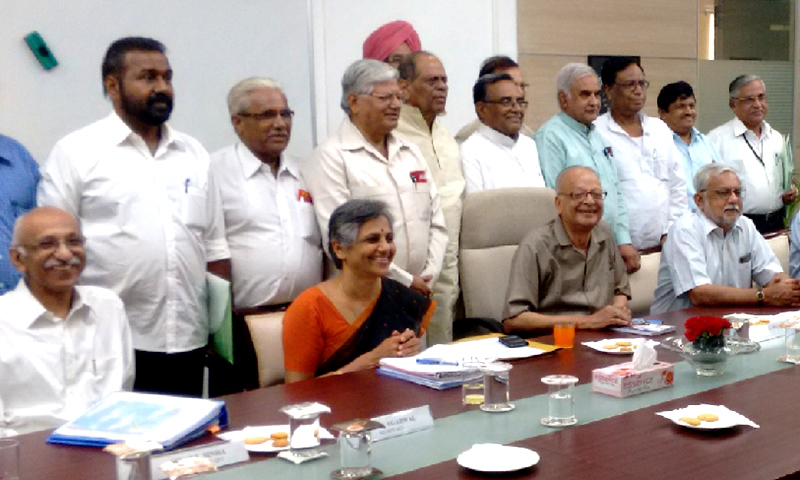 Usually and historically only IAS officers have been members of the panel. This has led to a widespread resentment against officials of this particular service. The reason cited by others is that CPC tends to favor IAS officers more over other service holders. For instance, IRS (Indian Revenue Services) officers have long complained and demanded that the CPC panel should consist of at least one representative officer who can prevent and balance out the extra weightage IAS offices gain by being in CPC. The scenario becomes even grimmer in case of Defence Personnel. Defence forces belong to a completely different line of service with a completely different and far more demanding and challenging work role. Thus, it becomes imperative to have at least one officer from Defence who can put forward recommendations that are in best interest of the armed forces. Unfortunately, for long IAS officers have always managed to enjoy progressive increment in their pay structure during their service years and even in benefits and pensions once their service ends. This is not true for Defence personnel. The demand for inclusion of officers from difference services has been put forward to Indian government but no heed was paid to such demands. Even the 7th Central Pay Commission was formed under the whims and wishes of the former UPA government. What will happen in the next pay commission? No one has the answer to this because it will be another long wait until the commission formation is declared and approved by our government. The central government has recently announces 7th Pay Commission. This time too, the commission offered good news for all central government employees. It stated that around 1.1 crore people are associated with the central government offices. All these individuals will receive a 2% hike in the Dearness Allowance. Currently, 48.41 lakh people are employed with central government offices. Apart from them, additional DA will be granted for 62.03 lakh pension holders. This new announcement will put additional pressure on the central finance ministry. The Pay Commission said that this decision has been taken after carefully examining the current salary structure of central government employees.